More than 200 schoolgirls abducted by Boko Haram a year ago may be hidden in underground bunkers in Sambisa forest, according to Kashim Shettima, a Nigerian governor who has called for more decisive actions against the militants. "We are suspecting that Chibok girls are living with the insurgents inside bunkers, I think the military must carry out their operations [beneath] the earth's surface," Shettima said during a lecture in Abuja on Tuesday, the daily Nigeria’s Leadership reported. The governor believes that militants have dug a system of tunnels which gives them an opportunity to move from house to house. The girls the governor spoke about were the ones whose kidnapping in April 2014 shocked the world. 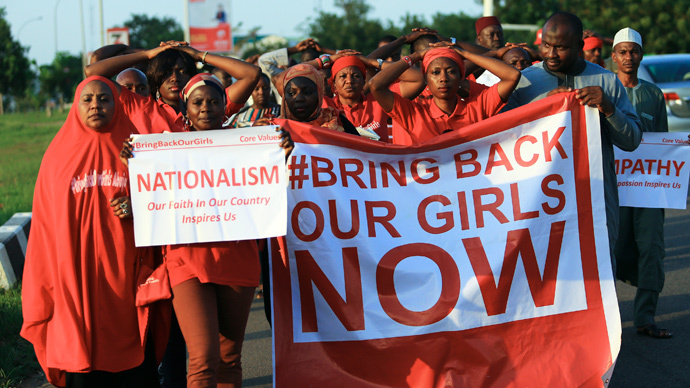 A total of 57 girls managed to escape from the militants, while 219 are thought to still be held captive, although in April and May the Nigerian army managed to free more than 500 women and girls held by the terrorist organization. According to the Borno state governor, the militants appear more rooted than the authorities used to think. "The insurgents used their bases in the Sambisa Forest to launch deadly attacks and make a quick retreat to their base which enabled them to capture and take over control of all the local government areas in the Nigeria, Cameroon, Chad and Niger borders, thus effectively cutting off the three neighboring countries, thereby declaring what they assumed was their independent territory [caliphate]," Shettima said. The Borno governor also accused media of underestimating the number of casualties in the conflict in northeast Nigeria. He claims the number of those killed by terrorists is 300,000 not the reported 13,000. “This year alone, more than 70,000 people were killed before Boko Haram was knocked out. So far, more than 300,000 people have been killed,” he said. “Any time I hear in the media that 13,000 people were killed so far, if not that Islam forbids suicide I would have committed suicide,” the governor added. Shettima warned that Boko Haram still poses a serious threat for northeast Nigeria. The terrorist group allegedly almost managed to encircle Maiduguri, the Borno capital, by cutting it off from all directions. From the governor’s point of view, the federal government must totally defeat Boko Haram by capturing their forest bases. This is the main condition for starting reconstruction and rehabilitation of the region, he said. Shettima criticized the federal government for downplaying the struggle against the militants. "As a government, we have spent over 600 million Nigerian naira ($3 million), but all we have received from the Federal Government is 200 million naira ($1 million). The same Federal Government has approved over 2 billion naira ($20 million) on dancers (entertainers) as a loan," he said. Boko Haram, a terrorist organization that is seeking to establish a caliphate in Northern Nigeria and rejects the idea of western education, suffered several defeats at the hands of Nigerian, Cameroonian, Chadian and Nigerian forces in early 2015. It still holds some territories in northeast Nigeria, however. In early March, Boko Haram pledged allegiance to Islamic State and in April changed its name to Islamic State’s West Africa Province.